England paceman James Anderson inspects the ball on final day of the fourth Ashes cricket Test match against Australia at the MCG in Melbourne. 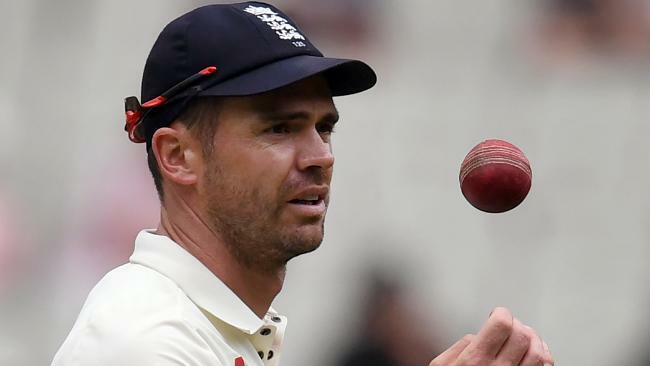 CRICKET: England bowler James Anderson has dismissed insinuations about ball-tampering in the fourth Ashes Test as "ridiculous". Australian TV cameras broadcast footage which Channel Nine commentators - Shane Warne the most vocal - claimed showed England's all- time leading wicket-taker digging his thumb nail into the ball during Australia's second innings in Melbourne. England's Australian coach Trevor Bayliss referred to misinformed over-reaction to the incident as "Pommy-bashing", and it was swiftly and universally acknowledged Anderson had done nothing wrong. 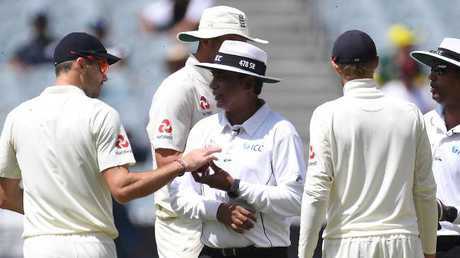 James Anderson (left) and Stuart Broad of England (second from left) and Joe Root of England speak with the match umpires on day four of the Boxing Day Test. Warne appeared to upset the England camp with his comments about Anderson, saying "I'm not sure you are allowed to use your fingernail there. If you are going to touch the ball at all, it's not just shining it, you want to do it right in front of the umpire so they know there is nothing untoward going on. "But, this might get some people talking." Speaking for the first time about the furore over broadcast frames of him cleaning mud off the ball, in full view of the umpires, and with their approval, Anderson revealed his frustration. "It escalated quite quickly, didn't it?," he said. "Ridiculous, but what we've come to expect ... crazy really. "I think you've got to have a thick skin, definitely. "If you start worrying about ex-players or whoever, whether they are opposition ex-players or even English ex-players ... you've got to try to block them out. "We know as a group how well we are doing as a team, or not well. "I think that's the most important thing, what we think." The Ashes campaign concludes with the fifth Test in Sydney, starting on Thursday, with the tourists hoping to break their duck from 3-0 down. And Anderson added: "It's a horrible situation, because we thought we had a good chance of winning this series. "Obviously, it's not turned out that way but we'll just keep working hard and try to have one last push (and) get a result in Sydney," Anderson said. "We've got a really strong group, a strong core of players, good management as well but it's just not worked. "I'd feel disappointed for this group if we didn't get a win on this trip, because we've worked so hard."